The concept of building in moulded plastic a boat that otherwise resembles an inflatable is not new, but the Whaly has a whole set of design features that make it unique. One possibly unique feature is its place of origin: I can’t recall any other leisure boat imported from the Netherlands. But if those people don’t know a thing or two about building boats who does? UV stabilised polyethylene has some great advantages over other materials. Softer than fibreglass, it is also naturally slippery and tends neither to damage itself against jetties nor other boats it comes alongside. It is far more resistant to damage than an inflatable and vastly longer lived. It is actually enormously resistant to damage, yielding rather than cracking or tearing, and scratches are no problem because the colour goes all the way through the material. If some unthinkably powerful impact pierces it, the Whaly is double hulled for safety and the hole can be simply repaired by plastic welding. The tough, nearly maintenance free properties have made it the material of choice for fish farm workboats and oil spill response boats. An obvious local application is as a tender to a larger vessel. The review 435 (a little over 14ft) is the largest in the Whaly range, and might sound on the small side. But under European certification it can carry from eight to 12 people depending on area of operation. The significant beam of 1.73 metres and vast volumes of buoyancy have much to do with this. Our 435 had the maximum size of outboard, a 30hp Honda. This was controlled from a side console, but the Whaly’s ingenious internal arrangement allows it to have the alternative of tiller steering. The main seating is provided by fore and aft side benches with four slots each side on the benches’ vertical inboard face. These accept drop in – or take out - box thwarts and a drop in console. We had just one thwart in place for the driver’s seat. This was pierced for steering, throttle and power cables, the battery fitting neatly in the half thwart alongside the console. Inflatable style, the Whaly is fitted with a grab line for passenger safety. Unlike an inflatable’s loose beckets, though, this is tightly stretched quarter to quarter via the bow. Held in place by 17 mounting points it provides genuine security. There is not a lot of storage available; take out the thwarts and there is none beyond the lidded anchor well. In tender mode, so what? Space is the thing for that job. With the driver’s thwart in place there is storage for all the vital stuff, and in a no-nonsense boat like this frivolous stuff would be out of place. A boat this practical should be serious minded, but instead it turned out to be a fun package. 30 horsepower gives it real performance, and it manoeuvred like a sports boat. This is not an offshore boat but the hull has useful deadrise and coped well with the Swan’s chop and assorted wakes. 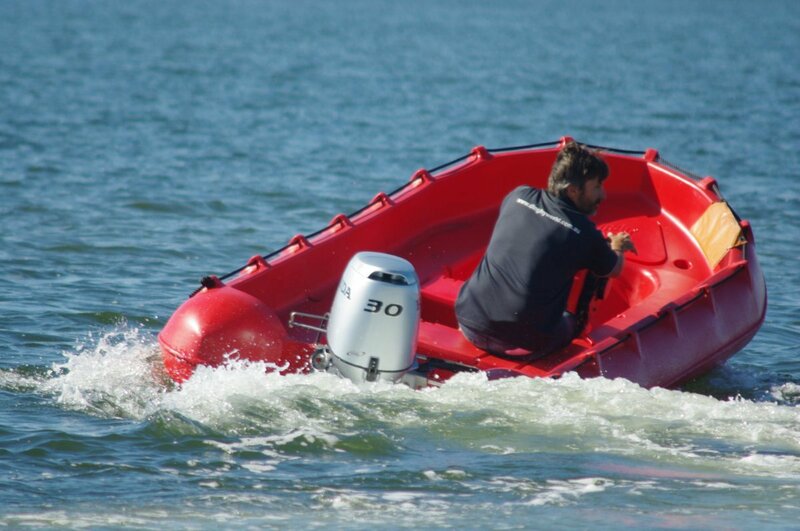 Although the obvious role for the Whaly is as a tender, it would fit the bill for most things you do with a five metre open boat. Its lack of crevices suits it to some of the noxious substances that come aboard in crab nets; divers would favour the low sides; the phenomenal stability is just as acceptable for inshore fishing as it is for passenger carrying. 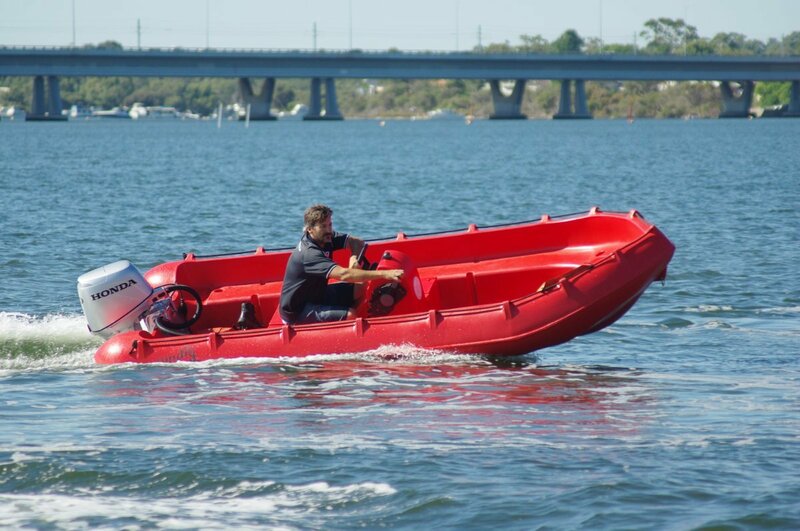 A couple of tasks that would use its special properties could be hire boat fleets and sailing dinghy rescue boats. For a boat likely to last a lifetime or more the Whaly 435 is not expensive. Powered by the Honda you need to part with $16,550, but you can shave off more than $3,000 by substituting a Tohatsu two-stroke. That’s cheap boating.